A fisherman does pitch a bait now and then, why not throw a curve? Ok, right now I know what you’re thinking. This guy has gone over the edge, or maybe it’s a new way of casting around stumps using a three finger grip. Man that doesn’t that sound cool. A fisherman does pitch a bait now and then, why not throw a curve? You got it, throwing a curve for cold water Trout is exactly what I’m talking about. The last time me and my fishing partner were on the water we broke out a few curves and they were quite productive. Fishing lures come in just about as many shapes as they do colors. Torpedo, dragon fly, lizard, worm, eel, long, short, fat, skinny, oval and curved just to name a few. In this Blog I’m going to try and describe four different curved fishing lures and when I use them. The first is the Yo Zuri Pin’s Minnow. This lure comes in two styles, floating and sinking. It also comes in three lengths. I prefer the 2.75, 1/8 OZ sinking type. 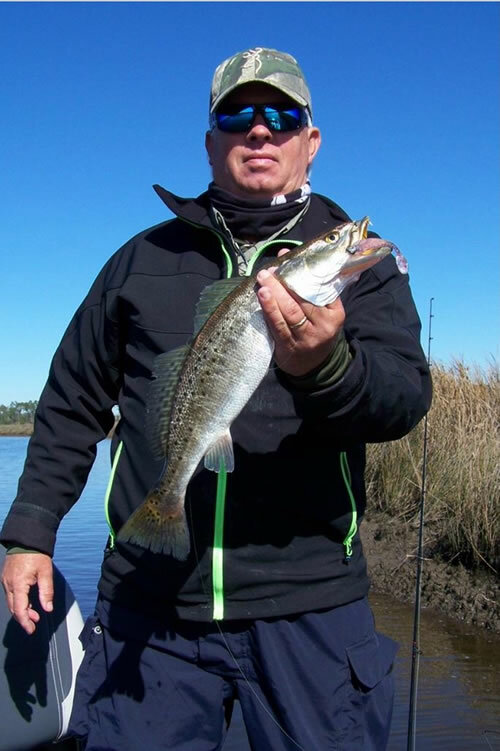 This is a great lure for mid morning and late afternoon when fish are feeding on the flats. The Yo Zuri has a ball bearing weight distribution system which makes casting easier. With a 6.3/1 casting reel and using medium slow retrieve this will cause the lure to swim down about a foot. The action and flash is incredible. Sometimes I pause it for about a second to induce a strike. The second is once again a Yo Zuri lure. It’s the Yo Zuri “L” Minnow. I was introduced to this lure last winter by the Mississippi Man himself. He can flat fish it too. The Lo minnow is designed to produce a tight wobbling action. The body is slightly bigger than the Pin’the s minnow and runs a little deeper. You can vary the depth by counting off a second or two as it sinks to the desired depth. I like to use this lure anytime I’m fishing the middle water column in four to six feet of water. The next lure is the Rapala Flat Rap. The Flat Rap is a suspending bait. It’s made of balsa with a great profile for casting. The sides are flat just like the name implies. Because the sides are flat it flashes it’s color pattern as it swims. It runs deeper than the above mentioned L minnow and I fish it with a pronounced three second pause. I like to fish this lure when I’m in six to eight feet of water. The pause is a critical part of my retrieve. Most of the time the strike comes during the pause. The last curve I want to address is the Rapala Husky Jerk. The Husky Jerk is one of those stick baits that can be deadly on those cold winter days. The Husky Jerk comes in several sizes but I like to use the HJ 10. I have the eight and the twelve but I really prefer the ten. This lure is also a suspending lure and it runs deeper than the Flat Rap. I like to use it in the bends of bayous and deep holes. My retrieve utilizes a five second pause. That’s right I said five seconds. I know that sounds ridiculously long, but it’s what I do. As with any presentation, you will have to vary depth, speed and pause till you dial em in. When conditions are right. I mean the the water is clear with a slight current and the water temp is cool, say around 54. You’ve got you’re jacket on and the sun has warmed you up. You might even be day-dreaming about that buck you missed last Saturday. A cast is made and you just paused the slow retrieve for the forth time and then, BAM. Man I’m telling you when they hit, they hit hard. Hope you enjoyed these curves.